This is an exceptionally cute looking cereal. 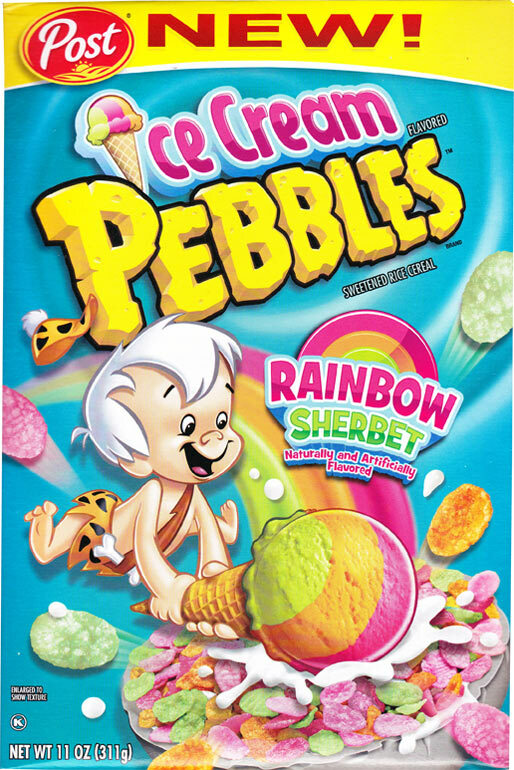 It's rainbow sherbet flavored and the packaging and cereal pieces have a very colorful, inviting tone. On the plus side, it's really wild how much this cereal smells like rainbow sherbet ice cream when you open the box. I passed the box around the office and we were all genuinely impressed. On the negative side, the flavor isn't as impressive as the fragrance. The cereal just tastes like Froot Loops or original Fruity Pebbles without any grape. 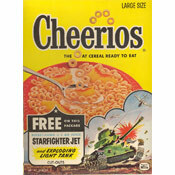 There's an emphasis on the citrus flavors which does make the cereal simultaneously sweet and tangy. That's fine, but it's at odds with the implied sherbet connotation which had me expecting a bit more of cool, creamy flavor element. This cereal might be a hit with Fruity Pebbles fans, as the flavor is strikingly similar. For those looking for a new flavor experience, I'd recommend just sniffing this one and buying something different. My score for this cereal is the score that I would have given original Fruity Pebbles minus 2 for being a somewhat unsuccessful copycat. The $0.00 price amount below reflects that a sample of the product was provided to us by the company. 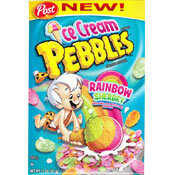 What do you think of Ice Cream Pebbles? It tastes a bit greasy, almost like rainbow sherbet flavored Chapstick. I disagree on the flavor. This is remarkably similar to rainbow sherbet. My favorite!